Section 8 of the Indian Patents Act deals with the “Statement and Undertaking” regarding submission of details of foreign applications by an applicant at the Indian Patent Office. 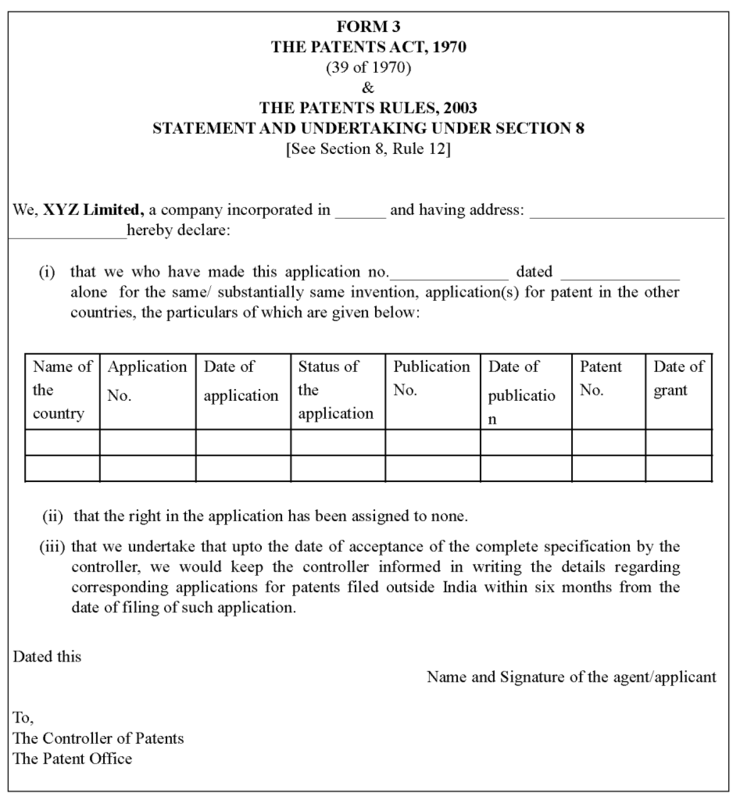 This is a peculiar requirement by the Indian Patent Office in connection to a patent application filed in India. Under Section 8(1) of the Indian Patents Act, an applicant has to provide a statement disclosing the detailed particulars of applications filed outside India corresponding to the Indian patent application. According to Rule 12, the applicant is required to submit the information within 6 months from date of filing in India. It should be noted that the requirement is about submitting family member information and not any disclosure about prior art etc. In compliance with clause (b) of Section 8(1), the applicant is required to submit an undertaking that he would keep the Controller updated from time to time about the detailed particulars of the corresponding foreign applications. In addition to that, under Section 8(2), the applicant is required to submit such information when the Controller (Patent Office) requires or calls for such information from the applicant. According to Rule 12, such information is required to be submitted within 6 months of such a request. 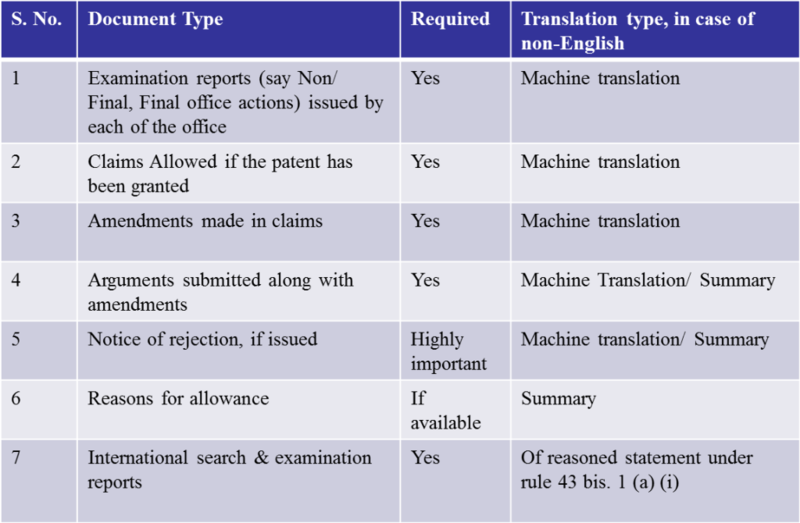 It is worth noting and emphasizing that the IDS requirements in the US patent law are different in comparison to the Section 8 requirements of the Indian Patents law. According to the IDS requirements of the USPTO, an applicant is required to submit the background art, prior art documents, citations, and other such documents which are relevant to the patentability of a particular patent application. There is a specified Information Disclosure Statement form available at the USPTO for such submissions. Whereas according to Section 8 of the Indian Patents Act, the applicant is required to submit the details regarding corresponding foreign applications. In simple words, one can say that the IDS requirements of the USPTO, requires the prior arts which the applicant might have found before filing his patent application. The applicant might have conducted a prior art search and hence concluded to file the patent application. There are some questions that frequently arise with respect to Section 8. One of the questions which arise is what actually is required to be submitted under Section 8(2)? Another question which arises is that what does the details relating to processing of foreign applications mean? With respect to these questions, the applicant must furnish the details (name of the country, date of application, application number, status of the application, date of publication, patent no. and date of grant) of family members to the patent office in officially prescribed Form 3. As noted above, even if the invention is assigned to another entity in another country, still the applicant is required to keep the Patent Office informed of such an application. In view of developments and case laws with respect to Section 8, it is observed that failure to disclose such information may lead to opposition and may also be a ground for revocation of a granted patent. Under Section 25(1)(h) of the Act, a person may file an opposition either to a pending published patent application or the person may file a post grant opposition under Section 25(2)(h). Further, failure of submission of such information may lead to revocation of a granted patent under Section 64(1)(m) by the Intellectual Property Appellate Board. It is observed and understood that the objective of submitting documents under Section 8 is to assist the Examiner in examining the patent application. Few decades ago, the availability of internet to people was localized and limited. During those days, it was difficult for the Examiners to get the updates on the corresponding foreign filed patent applications. Hence, the burden of submitting the foreign filing details relied upon the applicant. To the contrary, now-a-days, internet is widely available and at much higher speed in comparison to olden days. Moreover, it has become extremely simple to surf the internet and find out information about the foreign filed patent applications. But, there still lies a responsibility of the applicant to acquaint the Examiner with the developments of the corresponding foreign filed patent applications due to complexity of global patent regimes and language complications. 1. Richter Gedeon vs. Cipla: In this case, at the Indian patent office, Indian company Cipla filed a post grant opposition to the Indian Patent No. 202297 of Richter Gedeon under Section 25(2) of the Patens Act alleging multiple grounds including non-compliance with Section 8. The patentee had filed a national phase application in India on December 9, 2003 with an undertaking under Form 3. The next updated Form 3 was filed on October 25, 2004 only mentioning the patent application’s entry into several countries. From the facts narrated in this instant order it appears that the applicant had voluntarily abandoned the JP and USA applications after the grant of the Indian patent. The obligation to provide updated information with the patent office, is applicable till the Indian patent is granted and not thereafter. However, from the order of the Controller it appears that the applicant may not have kept the Patent Office updated about the information in relation to the JP and USA prosecution before the grant of patent. The Patent was revoked on multiple grounds including Section 8 compliance. 2. Chemtura Corporation vs. Union of India: In this case, Chemtura Corporation was granted Indian Patent No. 213608 on January 9, 2008. In some infringement proceedings in High Court, Union of India alleged that Chemtura had failed to comply with the requirements under Section 8 and therefore their patent was invalid. In this case, it is mentioned that even though the Patent Office through its letter dated October 20, 2004 had called upon Chemtura to disclose “details regarding the search and/or examination report including claims of the application allowed…. in respect of same or substantially same invention filed in any one of the major patent office such as USPTO, EPO and JPO etc”, in its response, Chemtura did not submit any relevant information. In fact, Chemtura had replied by a letter dated October 17, 2005 that there had been no further development and thus no further information was required to be submitted. The High Court observed that the patent applicant was required to furnish any and all foreign search reports in its possession at the time of its reply to the patent office i.e. as on October 17, 2005. The court referred to the corresponding US application and European application where the claims were narrowed to a greater extent and an acceptable limit. The Delhi High Court then held that an applicant was required to periodically update the Controller on the current status of the corresponding foreign applications and that mere furnishing of information on the status of the application did not satisfy the requirements of Section 8(2) of the Act. Especially, the court in this case pointed out to the deliberate attempt of the applicant in concealing the status of family members, in light of unfavourable developments in other patent offices. 3. Roche vs. Cipla: It is interesting to note that in this particular case, the High Court did not revoke the patent even though it was concluded that Section 8 requirements had not been complied by Roche prima-facie. The Delhi High Court relied on the fact that Section 64 uses the word ‘may’ and this gives the Court discretion not to revoke the patent based on the facts of this case. It was a fact, that Roche was granted an Indian Patent No. 196774 on February 23, 2007 and application for the Indian Patent was filed on March 13, 1996. Roche had filed an infringement action against Cipla for infringing on its patent 196774. In its counter claim, Cipla alleged that Roche did not comply with the requirements under Section 8 of the Indian Patents Act. In this regard, Cipla mentioned that Roche did not disclose US Patent 6900221 which was filed subsequent to the filing of the Indian Patent application, in 2000. Cipla contented that this US patent consisted of a polymorph B version of the drug and thus relates to the same or substantially the same invention and should have been disclosed to the controller as required under Section 8. According to Roche, polymorphic version B of the said compound would not come within the meaning of same or substantially the same invention. Further, Roche also contended that Polymorphic version B compound is different from the Indian patent and therefore Roche was not required to disclose the US patent under Section 8. Further, Roche in its infringement claim had contended that the drugs made available in the market by Cipla, was a polymorph version B of the drug and this drug fell within the scope of the Indian Patent 196774. The court held that Roche had not complied with the requirements of section 8. However, the court did not revoke the patent. The court stated that the discretion to revoke or not to revoke a patent lies with the Court and this exists by use of the word “may” under Section 64 of the Patents Act. 4. KONINKLIJKE PHILIPS ELECTRONICS N.V. vs. Sukesh Bahl: This is another interesting case, in which a patent was spared of revocation by the courts even though on the face of it, the patentee did not seem to comply with literal requirements of Section 8. In this particular case, Philips owned an Indian Patent no. 218255 which was granted on 31st March 2008. They filed a suit for infringement against Maj. (Retd.) Sukesh Behl, proprietor M/s. Pearl Engineering Company (Defendant No.1) and M/s. Pearl Engineering Company (Defendant No.2) for permanent injunction to restrain the Defendants from infringing the Plaintiff's Essential DVD Video/DVD ROM Disc Patents, in particular Indian Patent registered under No. 218255 and for other incidental reliefs. In their counter claim, the defendants prayed that the said patent should be revoked and be declared as invalid. The ground for seeking revocation was the failure of the Plaintiff to disclose the information to the Controller of Patents in relation to the requirement under Section 8. To this, the plaintiff filed a list of corresponding foreign applications before the Controller of Patents. The reason assigned for delay and inadvertence was that the details of the corresponding foreign applications which were printed on back side of the paper were inadvertently not filed and only some part could be filed. The court was of the view that the any violation of the requirement under Section 8 may attract Section 64(1)(m) for revocation of the patent, such revocation is not automatic. Further, the court pointed out that in this particular case, the applicant was inadvertent and not deliberate in concealing information about foreign family members. Furthermore, the court also was non-conclusive in regard with the importance of information which was omitted from submission by the patentee. The Section 8 requirements in Indian patent law, requires an applicant to furnish the details (name of the country, date of application, application number, status of the application, date of publication and date of grant), within a stipulated filing in India. As noted above, even if the invention is assigned to another entity in another country, still the applicant is required to keep the Patent Office informed of such an application. Further, the applicant is required to submit the copies of all searches and examination reports including claims as allowed in respect of any family applications including CIPs, divisional, refiling etc. as the applicant is under a continued obligation to provide such details. Additionally, please note that in the Examination Report, the Examiners may require the applicant to submit English translation of any non-English document corresponding to the foreign filed patent applications. Although the requirements of this provision may seem to be taxing for the applicants, according to recent case laws and developments, the level of compliance seems to have been diluted. Especially, in Roche case and Philips case, the courts seem to have brought the dimensions of materiality of information and intention of the applicant in following the provisions of Section 8. The courts have further emphasized on the discretionary power of the courts and factual context in determining whether Section 8 requirements have been met or not. These new dimensions added in the law about Section 8 have come as a relief for applicants, who at one point have complained about the stringency of Section 8 requirements. Although, this should not make the applicants complacent while meeting Section 8 requirements. The Section 8 requirements still pose enough burdens on the applicants to be careful while meeting the requirements. Therefore, a careful consultation with your patent attorney about meeting Section 8 requirements is advisable. In case, there are any queries, you may feel free to email us at mail@gip-india.in. The details are submitted in Form 3. Please see Annexure 1.